Sir Ian Murray McKellen, CH, CBE (born 25 May 1939) is an English actor. He is the recipient of six Laurence Olivier Awards, a Tony Award, a Golden Globe Award, a Screen Actors Guild Award, a BIF Award, two Saturn Awards, four Drama Desk Awards and two Critics' Choice Awards. He has also received two Oscar nominations, four BAFTA nominations and five Emmy Award nominations. McKellen's work spans genres ranging from Shakespearean and modern theatre to popular fantasy and science fiction. The BBC states his "performances have guaranteed him a place in the canon of English stage and film actors". A recipient of every major theatrical award in the UK, McKellen is regarded as a British cultural icon. His most well known film roles include Gandalf in The Lord of the Rings and The Hobbit trilogies and Magneto in the X-Men films. McKellen was appointed Commander of the Order of the British Empire in 1979, was knighted by Elizabeth II in 1991 for services to the performing arts, and made a Companion of Honour for services to drama and to equality in the Queen's 2008 New Year Honours. He has been openly gay since 1988, and continues to be a champion for LGBT social movements worldwide. He was made a Freeman of the City of London in October 2014. McKellen was born on 25 May 1939 in Burnley, Lancashire, the son of Margery Lois (née Sutcliffe) and Denis Murray McKellen, a civil engineer. He was their second child, with a sister, Jean, five years his senior. Shortly before the outbreak of the Second World War in September 1939, his family moved to Wigan. They lived there through the war and his early childhood. They relocated to Bolton in 1951, after his father had been promoted. The experience of living through the war as a young child had a lasting impact on him, and he later claimed that "only after peace resumed ... did I realise that war wasn't normal." When an interviewer remarked that he seemed quite calm in the aftermath of 11 September attacks, McKellen said: "Well, darling, you forget—I slept under a steel plate until I was four years old." McKellen's father was a civil engineer and lay preacher, and was of Protestant Irish and Scottish descent. Both of McKellen's grandfathers were preachers, and his great-great-grandfather, James McKellen, was a "strict, evangelical Protestant minister" in Ballymena, County Antrim. His home environment was strongly Christian, but non-orthodox. "My upbringing was of low nonconformist Christians who felt that you led the Christian life in part by behaving in a Christian manner to everybody you met." When he was 12, his mother died; his father died when he was 24. Of his coming out of the closet to his stepmother, Gladys McKellen, who was a member of the Religious Society of Friends, he said, "Not only was she not fazed, but as a member of a society which declared its indifference to people's sexuality years back, I think she was just glad for my sake that I wasn't lying anymore." McKellen attended Bolton School (Boys' Division), of which he is still a supporter, attending regularly to talk to pupils. McKellen's acting career started at Bolton Little Theatre, of which he is now the patron. An early fascination with the theatre was encouraged by his parents, who took him on a family outing to Peter Pan at the Opera House in Manchester when he was three. When he was nine, his main Christmas present was a wood and bakelite, fold-away Victorian theatre from Pollocks Toy Theatres, with cardboard scenery and wires to push on the cut-outs of Cinderella and of Laurence Olivier's Hamlet. When he was 18 years old, McKellen won a scholarship to St Catharine's College, Cambridge, where he read English literature. McKellen with actors Billy Crudup and Patrick Stewart on 24 September 2013 for a press junket at Sardi's restaurant for Waiting for Godot and No Man's Land. While at Cambridge McKellen was a member of the Marlowe Society, appearing in Henry IV (as Shallow) alongside Trevor Nunn and Derek Jacobi (March 1959), Cymbeline (as Posthumus, opposite Margaret Drabble as Imogen) and Doctor Faustus. His first professional appearance was in 1961 at the Belgrade Theatre, as Roper in A Man for All Seasons, although an audio recording of the Marlowe Society's Cymbeline had gone on commercial sale as part of the Argo Shakespeare series. McKellen had taken film roles throughout his career—beginning in 1969 with his role of George Matthews in A Touch of Love, and his first leading role was in 1980 as D. H. Lawrence in Priest of Love, but it was not until the 1990s that he became more widely recognised in this medium after several roles in blockbuster Hollywood films. In 1993 he had a supporting role as a South African tycoon in the critically acclaimed Six Degrees of Separation, in which he starred with Stockard Channing, Donald Sutherland, and Will Smith. In the same year, he appeared in minor roles in the television miniseries Tales of the City, based on the novel by his friend Armistead Maupin, and the film Last Action Hero, in which he played Death. 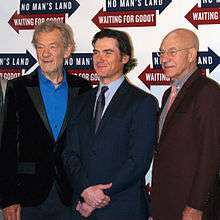 Later in 1993, McKellan appeared in the television film And the Band Played On, about the discovery of the AIDS virus, for which McKellen won a CableACE Award for Supporting Actor in a Movie or Miniseries and was nominated for the Emmy Award for Outstanding Supporting Actor in a Miniseries or a Movie. In 1995, he played the title role in Richard III, which transported the setting into an alternative 1930s in which England is ruled by fascists. The film was a critical success. McKellen co-produced and co-wrote the film, adapting the play for the screen based on a stage production of Shakespeare's play directed by Richard Eyre for the Royal National Theatre, in which McKellen had appeared. As executive producer he returned his £50,000 fee to complete the filming of the final battle. In his review of the film, Washington Post film critic Hal Hinson, called McKellen's performance a "lethally flamboyant incarnation", and said his "florid mastery ... dominates everything". His performance in the title role garnered BAFTA and Golden Globe nominations for Best Actor, and won the European Film Award for Best Actor. His screenplay was nominated for the BAFTA Award for Best Adapted Screenplay. 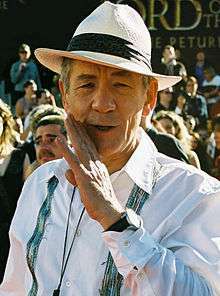 McKellen at the premiere of The Return of the King in Wellington, New Zealand, 1 December 2003. He appeared in the modestly acclaimed film Apt Pupil, which was directed by Bryan Singer and based on a story by Stephen King. McKellen portrayed a fugitive Nazi officer, living under a false name in the US, who is befriended by a curious teenager (Brad Renfro) who threatens to expose him unless he tells his story in detail. 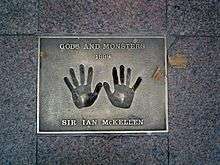 He was subsequently nominated for the Academy Award for Best Actor for his role in the 1998 film Gods and Monsters, wherein he played James Whale, the director of Show Boat (1936) and Frankenstein. In 1999 McKellen was cast, again under the direction of Bryan Singer, to play the comic book supervillain Magneto in the 2000 film X-Men and its sequels X2: X-Men United and X-Men: The Last Stand. 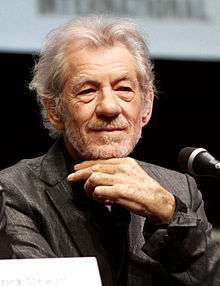 While filming X-Men McKellen was cast as the wizard Gandalf in Peter Jackson's three-film adaptation of The Lord of the Rings (consisting of The Fellowship of the Ring, The Two Towers, and The Return of the King). He received honors from the Screen Actors Guild for Best Supporting Actor in a Motion Picture for his work in The Fellowship of the Ring, and was nominated for the Academy Award for Best Supporting Actor for the same role. He also provided the voice of Gandalf for several video game adaptations of the films. On 10 January 2011 it was officially confirmed that Mckellen would reprise the role of Gandalf in the three-part film adaptation of The Hobbit. On 16 March 2002, he hosted Saturday Night Live. In 2003, McKellen made a guest appearance as himself on the American cartoon show The Simpsons, in a special British-themed episode entitled "The Regina Monologues", along with the then UK Prime Minister Tony Blair and author J. K. Rowling. In April and May 2005, he played the role of Mel Hutchwright in Granada Television's long running British soap opera, Coronation Street, fulfilling a lifelong ambition. He narrated Richard Bell's film Eighteen, as a grandfather who leaves his World War II memoirs on audio-cassette for his teenage grandson. In November 2013, McKellen appeared in the Doctor Who 50th anniversary comedy homage The Five(ish) Doctors Reboot. He reprised his role as Magneto in X-Men: Days of Future Past, released in May 2014; he shared the role with Michael Fassbender, who played a younger version of the character in 2011's X-Men: First Class. In October 2015, McKellen appeared as Norman to Anthony Hopkins' Sir in a BBC Two production of Ronald Harwood's The Dresser, alongside Edward Fox and Emily Watson. In 2017, McKellen will voice Cogsworth, the Beast's loyal butler, who was cursed into a pendulum clock, in a live-action adaptation of Beauty and the Beast. McKellen and his first partner, Brian Taylor, a history teacher from Bolton, began their relationship in 1964. Their relationship lasted for eight years, ending in 1972. They lived in London, where McKellen continued to pursue his career as an actor. For over a decade, he has lived in a five-story Victorian conversion in Narrow Street, Limehouse. In 1978 he met his second partner, Sean Mathias, at the Edinburgh Festival. This relationship lasted until 1988. According to Mathias, the ten-year love affair was tempestuous, with conflicts over McKellen's success in acting versus Mathias's somewhat less-successful career. Mathias later directed McKellen in Waiting For Godot at the Theatre Royal Haymarket in 2009. The pair entered into a business partnership with Evgeny Lebedev, purchasing the lease on The Grapes public house in Narrow Street. McKellen is an atheist. In the late 1980s, McKellen lost his appetite for meat except for fish, and so mostly excludes it from his diet. In 2001, Ian McKellen received the Artist Citizen of the World Award (France). He has a tattoo of the Elvish number nine, written using J. R. R Tolkien's artificial script of Tengwar, on his shoulder in reference to his involvement in the Lord of the Rings and the fact that his character was one of the original nine companions of the Fellowship of the Ring. The other actors of "The Fellowship" (Elijah Wood, Sean Astin, Orlando Bloom, Billy Boyd, Sean Bean, Dominic Monaghan and Viggo Mortensen) have the same tattoo. John Rhys-Davies, whose character was also one of the original nine companions, arranged for his stunt double to get the tattoo instead. He became an ordained minister of the Universal Life Church in early 2013 in order to preside over the marriage of his X-Men co-star Patrick Stewart to his then fiancée Sunny Ozell. McKellen was awarded an honorary Doctorate of Letters by Cambridge University on 18 June 2014. He was made a Freeman of the city of London on Thursday 30 October 2014. The ceremony took place at Guildhall in London. McKellen was nominated by London's Lord Mayor Fiona Woolf, who said he was chosen as he was an "exceptional actor" and "tireless campaigner for equality". He is also a Fellow of St Catherine's College, Oxford. 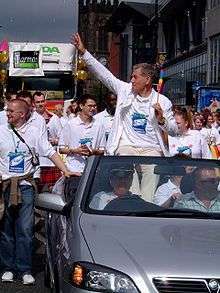 McKellen at Europride 2003 in Manchester. While in New Zealand filming The Hobbit in 2012, McKellen announced a special New Zealand tour "Shakespeare, Tolkien, and You! ", with proceeds from the shows going to help save the Isaac Theatre Royal, which suffered extensive damage during the 2011 Christchurch earthquake. McKellen said he opted to help save the building as it was the last theatre he played in New Zealand (Waiting for Godot in 2010) and the locals' love for it made it a place worth supporting. In 1987, McKellen appeared reciting Shakespeare while the Super Rock group The Fleshtones improvised behind him on Andy Warhol's Fifteen Minutes which ran on MTV. Audiobook narrator of Michelle Paver's series Wolf Brother, Spirit Walker, Soul Eater, Outcast, Oath Breaker, and Ghost Hunter, as well as a version of Homer's The Odyssey. ↑ The London Gazette: (Supplement) no. 47888. p. 4. 26 June 1979. Retrieved 14 February 2013. ↑ The London Gazette: (Supplement) no. 58557. p. 4. 29 December 2007. Retrieved 31 December 2007. ↑ Barratt 2006, p. 1. 1 2 3 4 "Ian McKellen From the Beginning". Ian McKellen Official Website. Retrieved 5 January 2014. 1 2 "Pierless Youth". The Sunday Times Magazine. 2 January 1977. Retrieved 5 January 2014. ↑ Gold, Matea (14 November 2009). "Full Interview with McKellen". Los Angeles Times. Retrieved 8 January 2014. ↑ "Ian McKellen traces roots to Ballymena". UTV. Retrieved 3 February 2013. 1 2 3 Steele, Bruce C. (11 December 2001). "The Knight's Crusade". The Advocate. pp. 36–38, 40–45. Archived from the original on 22 March 2007. Retrieved 16 February 2009. ↑ Adams, Stephen (30 November 2009). "McKellen about his stepmother". The Daily Telegraph. London. Retrieved 8 January 2014. ↑ "Famous Old Boltonians". Bolton School. Retrieved 14 June 2009. ↑ "Bolton Little Theatre". Bolton Little Theatre. Retrieved 14 June 2009. ↑ Curtis, Nick (9 December 2005). "Panto's grandest Dame". Evening Standard. London. Retrieved 7 February 2010. 1 2 3 4 Trowbridge, Simon (2008). Stratfordians. Oxford, England: Editions Albert Creed. pp. 338–343. ISBN 978-0-9559830-1-6. ↑ "Marlowe Chronology". Cambridge University Marlowe Dramatic Society. Retrieved 31 July 2010. 1 2 Drabble, Margaret (1993). "Stratford revisited". In Novy, Marianne. Cross-cultural performances: differences in women's re-visions of Shakespeare. Urbana: University of Illinois Press. p. 130. ISBN 0-252-06323-6. ↑ Steven, Alasdair (6 September 2012). "Obituary: Toby Robertson, OBE, theatre director". The Scotsman. The Scotsman. Retrieved 2013-09-16. ↑ Paddock, Terri (31 October 2008). "McKellen & Stewart Wait in Haymarket Godot". Whatsonstage.com. Retrieved 8 July 2009. ↑ Wolf, Matt (7 May 2009). "McKellen and Stewart Deliver a 'Godot' With a Difference". New York Times. Retrieved 8 July 2009. ↑ "The Little Theatre Guild of Great Britain". Littletheatreguild.org.uk. Retrieved 18 July 2011. 1 2 "BBC News – Paralympics: Games opening promises 'journey of discovery'". BBC News. 29 August 2012. ↑ "Six Degrees of Separation (1993)". Rotten Tomatoes. Retrieved 15 June 2009. ↑ "Site Search". Television Academy. ↑ "Richard III (1995)". Rotten Tomatoes. Retrieved 15 June 2009. 1 2 "Notes". Ian McKellen Official Website. Retrieved 15 June 2009. ↑ "A Rich 'Richard III' Rules". The Washington Post. 19 January 1996. ↑ "Apt Pupil (1998)". Rotten Tomatoes. Retrieved 15 June 2009. ↑ "2000's". Ian McKellen Official Website. Retrieved 25 April 2008. ↑ Rottenberg, Josh (10 January 2011). "Hobbit' scoop: Ian McKellen and Andy Serkis on board". Insidemovies.ew.com. Retrieved 18 July 2011. ↑ "Adrian Salpeter interviews Ian McKellen about Emile". Ian McKellen Official Website. Retrieved 27 June 2013. 1 2 "Ian McKellen Unable to Suspend Disbelief While Reading the Bible." at the Wayback Machine (archived 14 June 2006) Us Weekly. 17 May 2006. ↑ Wilson, Benji (11 April 2010). "The Prisoner: remake of a 1960s TV classic". The Sunday Times. London. ↑ Keyes, Rob (27 November 2012). "Patrick Stewart & Ian McKellen Join 'X-Men: Days of Future Past'". Screenrant. Retrieved 28 November 2012. ↑ "Ian McKellen: 'Working with Anthony Hopkins was bliss' - BBC News". Bbc.co.uk. 31 October 2015. Retrieved 31 October 2015. ↑ Kroll, Justin (April 10, 2015). "Ian McKellen to Play Cogsworth in Disney's 'Beauty and the Beast' (EXCLUSIVE)". Variety. Retrieved April 11, 2015. ↑ "Ian McKellen profile at Tiscali". Tiscali Film and TV. Retrieved 11 April 2005. ↑ "The stars of The Lord of the Rings trilogy reach their journey's end". SciFi.com. Archived from the original on 6 March 2007. Retrieved 31 May 2007. ↑ Noah, Sherna (11 December 2012). "Sir Ian McKellen speaks of prostate cancer shock". The Independent. London. Retrieved 5 August 2013. ↑ Gwynedd, Myrddin (14 December 2012). "Ian McKellen clarifies prostate cancer reports". The New Zealand Herald. APN New Zealand. Retrieved 2 September 2014. ↑ "Patrick Stewart's Wedding and Ian McKellen - TIME.com". TIME.com. 19 March 2013. ↑ "Sir Ian McKellen officiates Sir Patrick Stewart and Sunny Ozell's wedding – Metro News". Metro. ↑ "Honorary degrees 2014". Cambridge University Alumni News. Retrieved 19 June 2014. ↑ "Sir Ian McKellen receives Freedom of the City of London". cityoflondon.gov.uk. ↑ "When gay became a four-letter word". BBC. 20 January 2000. Retrieved 5 January 2010. ↑ "'Section 28'". Ian McKellen Official Website. 1 July 1988. Retrieved 20 August 2015. ↑ "Activism". Ian McKellen Official Website. Retrieved 13 July 2008. 1 2 "Ian McKellen becomes the Albert Kennedy Trust's new patron". The Albert Kennedy Trust. 5 January 2007. 1 2 "LGBT History Month 2007 PreLaunch". LGBT History Month. 20 November 2006. ↑ "Aim High". the Lesbian & Gay Foundation. Retrieved 15 June 2009. ↑ "Sir Ian becomes gay pride patron". BBC News. 10 May 2006. Retrieved 5 January 2014. ↑ "Ian McKellen's gay comment causes a stir on Singaporean TV." Archived on 23 May 2012 at Wayback Machine www.gmax.co.za. ↑ Staff Writer. "Ian McKellen backs Liverpool anti-homophobia effort". Pink News. Retrieved 20 June 2012. ↑ Advocate.com Editors. "McKellen Calls Moscow Mayor a Coward | News". The Advocate. Retrieved 18 July 2011. ↑ Sweney, Mark (19 April 2010). "Hollywood actors star in Age UK ad". The Guardian. London. Retrieved 21 April 2010. ↑ "Cricket: 'Fill the Basin' teams named". The New Zealand Herald. 7 March 2011. Retrieved 5 January 2014. ↑ "Hollywood vs Wellywood fills The Basin". New Zealand.com. Tourism New Zealand. 14 March 2011. Retrieved 22 January 2014. ↑ Panoptic Artifex – Christopher Baima & Greg Sweet (15 September 2013). "Honorary Board". Only Make Believe. Retrieved 5 January 2014. ↑ "Ian McKellen Makes Magic... Through Charity". Entertainment Weekly. 2 November 2012. Retrieved 5 January 2014. ↑ Kornowski, Liat (6 November 2013). "Ian McKellen Strips To His Undies at the Only Make Believe Gala". Huffingtonpost.com. Retrieved 5 January 2014. ↑ RadioLIVE. "Sir Ian McKellen on fundraising for the Isaac Theatre Royal". MediaWorks. Retrieved 13 April 2012. ↑ Staff (6 March 2003). "Dance of Death, Lyric Shaftesbury". BBC London. Retrieved 10 November 2008. ↑ Barclay, Alison (7 May 2010). "Sir Ian McKellen is mistaken for a tramp on a Melbourne bench between Waiting for Godot rehearsals". Herald Sun. Retrieved 17 May 2010. ↑ "Letters Live: Epistolary Joy At Freemasons' Hall". Londonist. ↑ "BBC Sherlock star, X Files actor and a host of other celebrities perform at charity event for the Reading Agency". The Guardian. ↑ Crompton, Sarah (30 May 2014). "Letters Live at Hay Festival". The Telegraph. London. ↑ "Ian Mckellen in Heart Album". Retrieved 8 January 2014. ↑ "Ian Mckellen reads 'Falling Out of Reach'". Retrieved 8 January 2014. ↑ Martin, Dan (14 April 2010). "Scissor Sisters collaborate with Ian McKellen: Lord of the Rings actor appears on final track of Scissor Sisters' long-awaited third album, Night Work". The Observer. London. ↑ Graham, Daniella (29 October 2014). "Sir Ian McKellen totally outshines George Ezra in Listen to the Man video". Metro. Retrieved 12 November 2014. ↑ "Ian McKellen reads Chronicles of Ancient Darkness". Retrieved 8 January 2014. ↑ "Ian McKellen reads Spirit Walker". Retrieved 8 January 2014. ↑ "Ian McKellen reads Soul Eater". Retrieved 8 January 2014. ↑ "Ian McKellen reads Outcast". Retrieved 8 January 2014. ↑ "McKellen reads Oath Breaker". Retrieved 8 January 2014. ↑ "McKellen reads Ghost Hunter". Retrieved 8 January 2014. ↑ "McKellen reading The Odyssey". Retrieved 8 January 2014. ↑ White, Michael (20 June 2011). "How to deal with the very worst concert nuisances". The Daily Telegraph. London. Retrieved 24 June 2011. ↑ Jim Pritchard (July 2010). "Verdi, La traviata: Soloists, chorus and orchestra of the Royal Opera House. Conductor: Yves Abel. Royal Opera House, Covent Garden, 8.7.2010". MusicWeb International. Retrieved 24 June 2011.